Wine is said to paint a picture on the palate of the place where it was born. As Cave Spring Cellars celebrates thirty years of winemaking excellence, it is with a sense of deep appreciation for the place our wines are born. Cave Spring has established itself as one of Canada’s most acclaimed wineries. The distinct soil and climate of our vineyards on the Beamsville Bench have and will always play a critical role in the ongoing journey of crafting elegant and distinctive cool-climate wines. Great winemaking finds its origins through a marriage of vision, passion and patience. More than three decades ago, the Pennachetti family helped to pioneer the cultivation of noble European grape varietals on the Niagara Peninsula with the planting of their first Riesling and Chardonnay vines at Cave Spring Vineyard. In the years since, Cave Spring Cellars has established itself as one of Canada’s most acclaimed wineries, earning a reputation for crafting elegant and distinctive cool-climate wines in the heart of Ontario’s wine country. For more than two decades Angelo Pavan has guided winemaking at Cave Spring Cellars, crafting wines of authentic character and sophistication from the fruit of Ontario’s Beamsville Bench. A passionate and gifted winemaker, with an encyclopedic understanding of Niagara Peninsula viticulture, Angelo has helped pioneer winemaking from noble European grape varietals in Ontario. Gabriel Demarco (B.A., Hon. B.Sc.) is a graduate with Honours of the prestigious Oenology and Viticulture Institute (OEVI) at Brock University in St. Catharines, ON, located at the heart of Niagara Peninsula. He began working in the vineyards of Cave Spring Cellars as an eager viticulture student in 2010. During his time with the company he has progressed to Assistant Winemaker and today plays an active part in the production and marketing of Cave Spring wines. Born in London, ON in 1980, Gabriel’s was not a direct path to winemaking. His urge to explore led him to leave home at the age of 18 to travel the world. After a period roaming the globe, his thirst for knowledge led him to McMaster University in Hamilton, ON where he studied theatre arts and world history. During these studies he joined the Canadian Naval Reserve, partly as a way to pay for his schooling, but also in order to travel and serve his nation. After the completion of his B.A. at McMaster, he moved to Winnipeg, MB where he graduated with an Hon. B.A. in Performance from the University of Winnipeg. Although he loved his time in the Prairies, Gabriel realized that it was time to establish roots near his family in Ontario. By 2005, Gabriel was a working actor in Toronto. Although wine had always been a part of his family’s culture, it was not until this stage in his life that he began to truly realize the depth of his passion for wine. From his early days in Toronto, he worked as a server for the great restaurant company Oliver and Bonacini (O&B) at Jump, a cornerstone of the culinary scene in the city’s financial district. Facilitated by O&B’s exceptional training regimen, Gabriel gained his Wine Spirit Education Trust (WSET) Advanced Wine Certificate, thereafter becoming an integral member of the Jump’s wine team. A few years later, in 2008 Gabriel once again felt the urge to travel. He earned a unique, one-year placement offered by the Italian government teaching English through theatre performance throughout Italy. While affording him an incredible experience visiting nearly every region of the country in-depth, this would prove to be the final acting job of his career. The incredible opportunity of waking up in some of the most revered wine regions in the world crystalized what had been on his mind for some time – his true professional calling was not acting, but rather winemaking. Upon his return to Toronto in the spring of 2009, he immediately applied for the highly regarded OEVI program at Brock University. That fall, he realized his new found ambition, packing his bags and moving to Niagara to begin his wine studies. 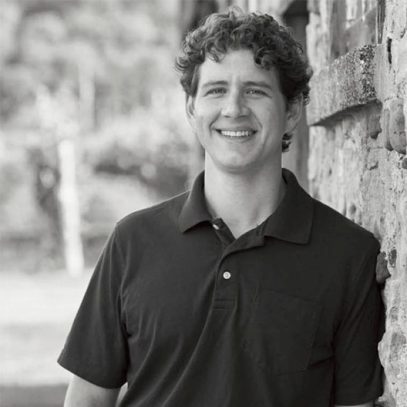 By the summer of 2010, after the completion of his first year at Brock, Gabriel was hired to work in the iconic vineyards of Cave Spring Cellars. He stated to friends at the time, “I only applied for one job, because I only wanted to work at one estate – Cave Spring”. Of all the properties in the region, he felt Cave Spring had the vineyards, winemaking and pedigree that offered the greatest opportunity for learning. He took full advantage that summer, and was hired back for summer and harvest placements throughout the remainder of his studies. Upon graduating from OEVI, Gabriel’s fit with winemaker Angelo Pavan and his entire team culminated in 2013 with his hiring as a full-time winemaker. His goal is to continue the great winemaking tradition set forth by his esteemed mentor, while using his training and experience to explore the art, science and business of winemaking in helping to further Cave Spring’s growth into the future. For more than 25 years, the combination of precise work in the vineyards and a measured touch in the cellars have made the Chardonnays from Cave Spring Vineyard standard-bearers for a style that emphasizes finesse, agebility and, perhaps above all, the steadfast belief in making Chardonnay that is true to its cool-climate origins. Today, among its more than 66 hectares of vineyards the winery farms 12 hectares of Chardonnay that are the source of 100% of the winery's production of this noble grape.